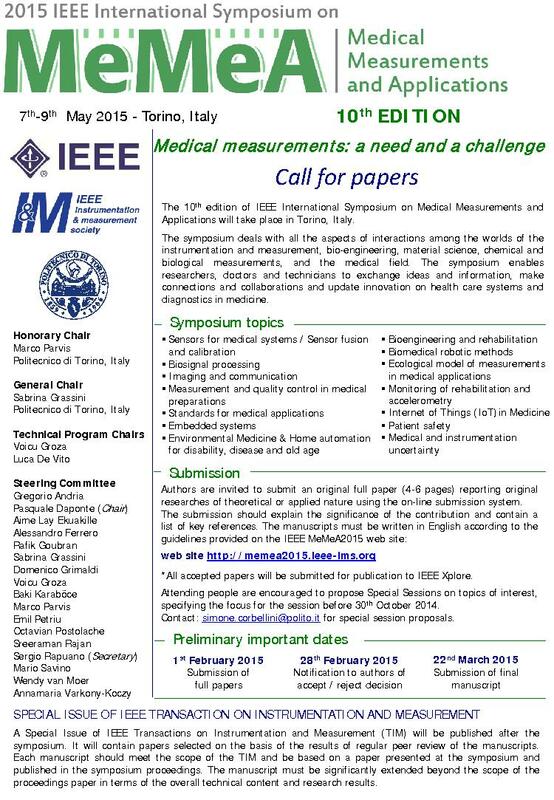 The MeMeA 2015 Special Issue of IEEE Transactions on Instrumentation and Measurement, intended to promote best results presented at the symposium, will be published in 2016. The MeMeA 2015 Special Issue will contain papers selected on the basis of the results of regular peer review of the manuscripts submitted for consideration by the participants of the symposium. Each manuscript shall be within the SCOPE of the IEEE Transactions on Instrumentation and Measurement (click to see Scope of Transactions), correctly framed within the published scientific literature in the field of Instrumentation and Measurement, based on a paper published in the MeMeA2015 Proceedings and presented at MeMeA2015. Moreover, the manuscript MUST be significantly extended beyond the scope of the proceedings paper, in terms of the overall TECHNICAL content and research results. Special issue manuscript may ONLY be uploaded in the period of July 6 to July 20, 2015. Please DO NOT try to submit your papers earlier, since the MeMeA2015 Special Issue folder in Allentrack will not be available. NO LATE MANUSCRIPTS WILL BE ACCEPTED. At the time of submission, the authors must provide a separate file with detailed information regarding how the manuscript is a technically-extended version of the proceedings paper, as per the instructions below. A PDF copy of the proceedings paper must also be submitted, as per the instructions below. The submitted file should be taken by the official proceedings. No previous versions of the proceedings paper file will be accepted. When uploading your manuscript click on “Special Issue Manuscript” in the “Manuscript Upload Instructions” page of the Allentrack System. Then, in page #1 of “Submit Manuscript” you must choose the proper Special Issue (i.e., MeMeA2015 Special Issue). Subsequently, in the same page and in the “Files to Upload” section you MUST upload two additional files; one with containing a detailed explanation of how the paper is TECHNICALLY extended beyond the scope of the proceedings paper and another which is a PDF copy of the MeMeA2015 Proceedings paper. To this end, you must put the number “2” in the small box in front of “Extension Beyond Proceedings & Copy of Proceedings (if any was published)” so that the system allows you to upload these two files. Consequently, these two files will be available to the reviewers. Please, do not include the explanation of how the paper is technically extended beyond the scope of the proceedings paper in the cover letter, because this letter is not visible to the reviewers. Failure to correctly submit a detailed explanation of the TECHNICAL extension and a PDF copy of the MeMeA2015 Proceedings paper will result in the immediate return of the manuscript to the author(s) as an unacceptable submission and the manuscript will not be accepted for submission to the special issue any longer. Notice: The MeMeA 2015 paper identifier should be put in the upper right-hand corner of every document to be submitted.